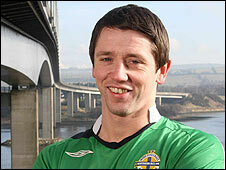 Coleraine striker Rory Patterson has been included in Northern Ireland's squad for the friendly away to Albania. But Nigel Worthington's plans to name Everton teenager Shane Duffy have been scrapped because the defender has opted to play for the Republic of Ireland. Andrew Little of Rangers is picked as a defender while David Healy is one of five strikers included for the 3 March match in Tirana's Qemal Stafa Stadium. Captain Aaron Hughes and Fulham team-mate Chris Baird are not in the squad. Worthington has included three keepers, including Trevor Carson of Sunderland. Jonny Evans is named even though Manchester United are playing Aston Villa in the Carling Cup final on Sunday at Wembley. Striker Patterson has been the Irish League's top scorer this season with 29 goals and has signed a pre-contract agreement to join champions Glentoran next season. 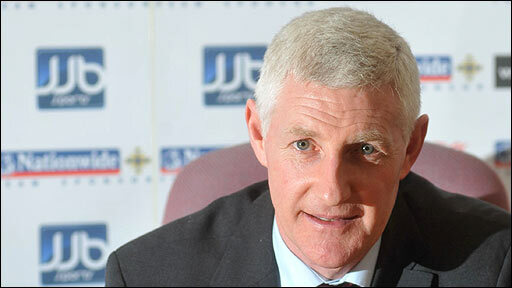 Worthington said he had spoken to Duffy but had not managed to persuade him to remain with Northern Ireland. Goalkeepers: M Taylor (Birmingham City), J Tuffey (Partick Thistle), T Carson (Sunderland). Defenders: G McAuley (Ipswich Town), J Evans (Manchester United), S Craigan (Motherwell), G McCartney (Sunderland), R McGivern (Manchester City), A Little (Rangers). Midfielders: N McGinn (Celtic), G McCann (Scunthorpe United), Michael O'Connor (Scunthorpe United), S Davis (Rangers), C Brunt (West Bromwich Albion), D Shiels (Doncaster Rovers), D Johnson (Birmingham City), S Clingan (Coventry City). Forwards: D Healy (Sunderland, on loan at Ipswich Town), W Feeney (Cardiff City), K Lafferty (Rangers), A Kirk (Dunfermline Athletic), R Patterson (Coleraine).